For a time I have been considering my “top ten” Mozart and Beethoven compositions. They are lists which were both easy and difficult to create because both masters composed so many brilliant masterpieces. Below are my top ten Mozart compositions. While it was not easy to compose this list in order of “greatness,” I have tried to assemble a list which as closely as possible, reflects what I believe to be the ten greatest masterpieces in order of greatness ever composed by Mozart. In some cases, as in the last three compositions on this list, it was difficult for me to assign a specific order. In the end, they are all remarkable and amazing works of art. There are also several other worthy compositions by Mozart which could have easily made this list. This just so happens to be my personal top ten Mozart masterworks. All but one of these masterpieces were composed during Mozart’s “Vienna” years between 1781 and 1791. The “Sinfonia Concertante” K. 364, was composed in Salzburg in 1779, and reflects a new found compositional maturity and overall depth in Mozart’s work after his failed trips to find a suitable post in Mannheim and Paris between 1777-1778, the death of his mother in Paris on July 3, 1778, and the loss of his first love, Aloysia Weber, the sister of the woman who would become his wife – Constanze Weber. What is so fascinating about Mozart in general is how his music does not necessarily reflect his personal feelings or commentary on the events of his life, as it so often does for Beethoven. It has sometimes been said of Mozart’s “Piano Sonata in A Minor,” K. 310, composed during the summer of 1778, that it reflects his personal feelings and agitation over the recent events of his mother’s death and his inability to secure a viable post. The choice of the key of A minor – when minor keys were considered at the time to be generally “unstable,” and the rhythmic intensity of this piece are sometimes said to supposedly reflect his personal agitation and emotional instability at the time he composed this sonata. While in this remarkably ingenious work there is a very new and almost breathless intensity to the outer movements and a calm serenity and depth in the second movement in F major, with its darker middle “B” section in the minor, this does not necessarily mean these aspects of the music reflect his personal feelings. His bright colored E-flat major “Symphony No. 39,” K. 543 and the triumphant C Major “Symphony No. 41,” K. 551, the “Jupiter,” were written during a time in which Mozart wrote pitiful begging letters for money to his friend and fellow Freemason Michael Puchberg. In one of these letters, Mozart spoke of “black thoughts which could only be banished with great difficulty,” yet no sign of this turmoil exists in these works he composed during this time. While it is true Mozart’s life events almost certainly influenced his creative life, these influences appear to have affected his compositional approach and/or technical preoccupations instead of a personal emotional reaction expressed in a work itself. The “Sinfonia Concertante” does indeed reflect a new found maturity and depth, but it is a growth in his compositional approach and an expansion of the range of the creative possibilities along with an increased intellectual complexity of his music. Mozart’s music transcends the personal and reaches us on a deeper and more universal level than music which strives primarily for personal emotional self-expression. 1. I have already reviewed why I find Mozart’s “Divertimento in E-Flat Major,” K. 563 such a profoundly exceptional Mozart masterpiece. I give this composition the top placement because I don’t think Mozart ever equaled and certainly never surpassed the transcendent beauty of the second movement of this work. While all of the movements are masterful and the entire work arguably the greatest string trio ever composed, it is this second movement which is for me, its crowning jewel. 2. The “Sinfonia Concertante in E-Flat Major,” for violin, viola and orchestra K. 364 is a staggering accomplishment for a 23-year old composer, who composed this work in 1779 and with it made a profound advance from the already exceptional beauty and mastery of his five violin concertos from 1775. The compositional range is greater, and the tone colors more rich, with Mozart utilizing a divided viola section in the orchestra. Mozart even makes use of the very rarely used technique of scordatura tuning for the viola, tuning it up a half-step, and writing the viola part in the key signature of D major so it would sound in the concert key of E-flat major. He did this to improve the sound quality of the viola whose timbre does not carry as well as that of the violin. The lovely duets written for the violin and the viola throughout this work show Mozart’s superb awareness of the capabilities of both instruments, as he could play each of them masterfully. He also exploits the large range of both string instruments beautifully and naturally within the context of the musical line. The depth of the second movement is the most profound utterance Mozart composed in his life at this time, and would rarely surpass in the future. 3. On May 1, 1786, Mozart’s great comic opera, “Le Nozze di Figaro” received its premiere at the Burgtheater in Vienna. The overture to this work is among the most brilliant and famous overtures ever written, and the opera is one of several Mozart operas in the core operatic repertory, and is certainly among his most beloved. The mere nine performances it received during its first run in Vienna had to have been deeply disappointing to Mozart, who put his whole heart and soul into this work about love, forgiveness, humor, the joys and conflicts between men and women, and the struggle for human dignity and happiness amidst an often unfair aristocratic system. In this opera, DaPonte and Mozart’s characters are real flesh-and-blood people who are realistically human, instead of being archetypical cardboard characters almost always found in opera at the time. On top of this realistic representation of humanity, the subject matter of commoners in conflict with the aristocracy hit a little too close to home at a time very close to the French Revolution, giving the Emperor Joseph II pause before finally agreeing to have it staged after much convincing by Mozart’s librettist, Lorenzo Da Ponte, and not Mozart himself as was fictionalized in the film “Amadeus.” The music is of a transcendent beauty and has a flow from one aria and recitative to the next in a seamless whole. It features some of the most beautiful orchestral and vocal music ever composed, especially for the soprano voice in the parts of Susanna and the Countess. The tour de force of the finale of the second act with several of the main characters joining the singing one by one in a delightful comedy of errors ending in a fantastic close is an extraordinary compositional and dramatic feat in the greatest finale to any act Mozart ever composed. 4. The “Clarinet Quintet in A Major,” K. 581 is a favorite of many, and the reasons are not hard to find. The combination of a string quartet with the clarinet in the endearing key of A major with its graceful, elegant melodies are only some of the reasons for its enduring popularity. As in his “Clarinet Concerto in A Major,” K. 622, Mozart masterfully exploits the entire range of the clarinet, even going beyond the lowest range of the modern clarinet since this work was actually written for a kind of “basset” clarinet owned by the man for whom this work and the concerto were composed – Anton Stadler. Since both the quintet and the concerto were composed for an extended range clarinet, and the autograph of both works are missing, there exists very well-done reconstructions of the original clarinet part to include the lower-register passages which appear to be “displaced” in the melodic continuity of both works in their originally published versions. The quintet features yet another transcendentally beautiful slow movement – this time in D major in which the clarinet is made to sing with the power of the human voice, and was clearly one of Mozart’s favorite instruments. He exploited the varieties of tone color of the clarinet, its range, and its varied articulation capabilities to create a work of extraordinary depth and beauty. 5. In his lifetime, Mozart composed 26 string quartets, including the three “quartet divertimenti” I reviewed in my last post. His “String Quartet No. 17 in B-Flat Major,” K. 458 is the third in a set of six string quartets he dedicated to his friend and mentor Joseph Haydn, who is considered the “father of the string quartet.” He heard the quartets Mozart dedicated to him in Mozart’s home on January 15 and February 12, 1785. Mozart’s father Leopold traveled from Salzburg to Vienna to visit his son, arriving on February 10, 1785, and was able to hear the premiere of three of the quartets performed in Mozart’s home on February 12, including K. 458. After hearing them Haydn said to Leopold, “Before God, and as an honest man, I tell you that your son is the greatest composer known to me either in person or by name. He has taste, and what is more, the most profound knowledge of composition.” Haydn understood the value of Mozart’s music, and knew it surpassed all he had heard, including his own outstanding compositions. It is not surprising after hearing what is regarded the pinnacle of Mozart’s achievements in string quartet writing, as well as the pinnacle of the Classical Era string quartet, Haydn would express such unbounded praise to Mozart’s proud father. I would concur with Haydn these works demonstrate Mozart’s unparalleled genius, and in this K. 458 quartet, Mozart made what he called a “long and laborious effort” sound effortless as he so often did. The fun 6/8 time “hunting” rhythm of the first movement, by which this quartet gets it nickname, “the hunt,” the beautiful minuet, the brilliant rondo finale and most of all, the glorious adagio third movement sets it apart in Mozart’s output. Indeed all six quartets are rare and exceptional masterpieces, but like the “Divertimento,” K. 563, it is the slow movement of K. 458 that puts it in a class by itself. It is difficult to describe how this miracle of sound achieves its effect. The warm and rich tone colors in the key of E-flat major, the silent pauses, the yearning of the first violin and the beautifully unexpected harmonic transformations after crescendos in the exposition and again in the recapitulation all combine to make this work a true rarity in Mozart’s output let alone in all of chamber music. 7. Mozart’s “Piano Concerto No. 23 in A Major,” K. 488 is another undisputed masterpiece for piano and orchestra, completed on March 2, 1786 while finishing work on Figaro. This work, at least in the outer movements, epitomizes the “sunny side” of Mozart’s pianistic genius, and like a carefree summer day from the opening bar of the first movement, inhabits an entirely different sound and dramatic world than the dark K. 466 D minor concerto completed just over a year before. Evidence from Mozart’s handwriting and the paper types he used in the autograph score of his “Piano Concerto No. 23 in A Major,” reveals Mozart began work on this piece in 1784 – the year he would complete no less than six piano concertos for subscription concerts. It is difficult to reconcile why he would not have completed work on it then, since the melodic material is even more beautiful, inspired, and profound than any of the six he completed in 1784. Nevertheless, when he picked up his quill two years later to complete the work in 1786, he decided to omit his original scoring for oboes and instead added a pair of clarinets – an ingenious choice Mozart exploits to the fullest in this beautifully composed work of art. Mozart’s orchestration utilizing softer tone colors in this lovely work is most definitely reminiscent of the tone color palette of Figaro, and the second movement written in the key of F sharp minor – the only movement Mozart ever wrote in this key, is essentially a beautiful tragic aria for piano and orchestra. The affect is of deep dramatic impact, especially after the brilliant and sunny tone colors of the first movement. The depth and originality of this second movement must have made quite an impression on its first audiences, and was likely appreciated by them as well since the slow movement to Mozart’s “Piano Concerto No. 22 in E-Flat Major,” K. 482 – also a deeply moving piece written in a minor key was so wonderfully received it had to be repeated. The last movement is a brilliant and virtuosic rondo finale which restores the sunny tone colors and bright key of A major from the first movement. 8. In the summer of 1788, over an extraordinary six-week period, Mozart composed his last and three greatest symphonies. They are all staples of the orchestral repertoire, and perhaps the most famous of the three is the “Symphony No. 40 in G Minor,” K. 550. While the tone of this work is darker than that of any of the other two symphonies in the trio, it could not be said to be necessarily “tragic,” but urgent and intense. What makes the opening of the first movement in particular so remarkable is how it begins as if “in the middle of something” – very unusual for Mozart. There is not an emphatic chord to start the work as found in so many symphonies, but a restless eighth-note figure in the violas under the main driving theme in the violins in octaves which begins immediately during the first bar. Throughout this work, there is a kind of restlessness and urgency rarely heard in Mozart’s music which is part of what makes it so unique. We only have a chance to catch our breaths in the lovely second movement, but even there, the persistent thirty-second note motif which pervades the entire movement – sometimes dark, and sometimes light, gives the piece a driving motion amidst an otherwise lilting, calm, and serene background. It may be said Mozart was always writing opera, even when not technically working on one. His sense of drama and color, contrast and texture are most evident in this lovely second movement, and the relentless intensity carries through in the minuet and then the rondo finale, in which Mozart utilizes an ascending “rocket motif” Beethoven would later use to begin his “Piano Sonata No. 1 in F Minor” Op. 2, No. 1. In this last movement, Mozart even looks ahead to 120 years or so in the future by starting the development section with a startlingly original melodic progression in unison which is essentially a 12-tone row as utilized by Arnold Schoenberg and Alban Berg in the 20th century. 9. The “String Quintet No. 6 in E-Flat Major,” K. 614 is the last masterpiece Mozart composed for the string quintet genre. It is in the string quintet, and not the string quartet where Mozart can be said to have reached his pinnacle in chamber music writing. All six are undisputed masterpieces of exceptional craftsmanship. The addition of a second viola, Mozart’s favorite string instrument, enriches the texture and the sonorous possibilities of the ensemble – one which Mozart was masterful in exploiting in all of his string quintets. Mozart completed K. 614 on April 12, 1791, just eight months shy of his death. It is a jovial work, with a cheerful 6/8 “hunting” theme in the first movement, and a dancelike theme and variations in the second movement, followed by a light and rhythmically diverse minuet, and an exceptional rondo finale – the crowning jewel of this work. In the development section of the finale, Mozart launches into a truly amazing contrapuntal section equal to Bach in its seamless and effortless execution with each instrument joining in imitation of the instrument before it, with harmonic turns all working together with a feeling of inevitable rightness so characteristic of Mozart’s music. Even when writing the most complex music with extreme demands of formal balance, the use of multiple motifs in contrapuntal imitation, and harmonic coherency, Mozart manages to make everything sound inevitable and obvious, as if it could not possibly be any other way than how it is. 10. 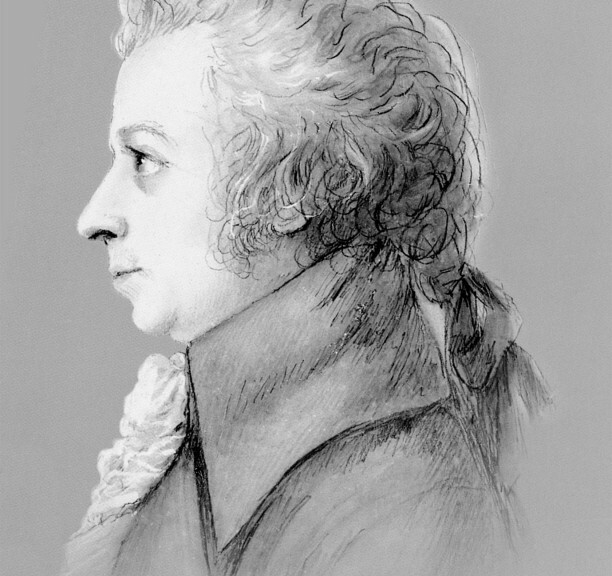 Of his 21 original concertos for one piano and orchestra, Mozart used clarinets in only three of them – K. 482, K. 488, and K. 491 – bearing witness to the fact clarinets were not yet in everyday use in Mozart’s time for all ensembles, unlike during the time of Beethoven, just one generation later in which clarinets were a staple of virtually every orchestra. Of those three concertos, Mozart only wrote one with both oboes and clarinets in the orchestra – the “Piano Concerto No. 24 in C Minor,” K. 491. It can be said Mozart never went further in his exploration of the possibilities of the piano concerto after this work, with his last three piano concertos more or less representing different versions of techniques and textures he already explored in the concertos before them. In this work, another favorite of Beethoven, which was the model for his own “Piano Concerto No. 3 in C Minor,” Op. 37, Mozart returns again to the minor – the only other minor key piano concerto he composed. Outside of the vast symphonic scope of this work and the brilliant and ingeniously virtuosic pianistic writing, the woodwind writing in this work is the most intricate and complex he ever wrote for a piano concerto. While much thematic material is given to the woodwinds in K. 482, Mozart in this work goes beyond his previous effort, especially in the second movement of this work in which the woodwinds carry almost all of the thematic material. The use of woodwinds to carry much of the thematic material in a piano concerto is an innovation Mozart began as early as 1784 with his “Piano Concerto No. 15 in B-Flat Major,” K. 450 in which the opening of the first movement begins with the main theme in oboes and bassoons. It is the huge scope of K. 491, the dramatic power, the large orchestra, and the rhythmic intensity of this concerto which so impressed the Romantics, and especially Beethoven who after hearing this work remarked excitedly to a friend, “We will never write anything like that!” Like the “Piano Concerto No. 20 in D Minor,” K. 466, this piece in its sheer power and innovation must have been a shock to its first audiences. Mozart’s top ten compositions is only the tip of the iceberg of what is an almost superhuman body of ingenious work by the greatest musical genius of all time. The fact this list represents eight separate genres bear witness to the scope of Mozart’s diverse genius. He was an unparalleled master of all forms, all genres, and all techniques. And while we may sometimes feel we have in a sense been “robbed” of even more masterpieces due to his very short life of only 35 years, what he accomplished in that time is more than double what many have produced in twice the time. It was for Beethoven to receive “the spirit of Mozart from the hands of Haydn” to continue the legacy of the Viennese Classical tradition into the stormy Romantic period of the 19th century.